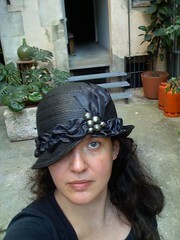 This beautiful 1920’s cloche is the result of the combined efforts of Nina and me. All credit for the design must go to her since I just helped her apply the trimming. 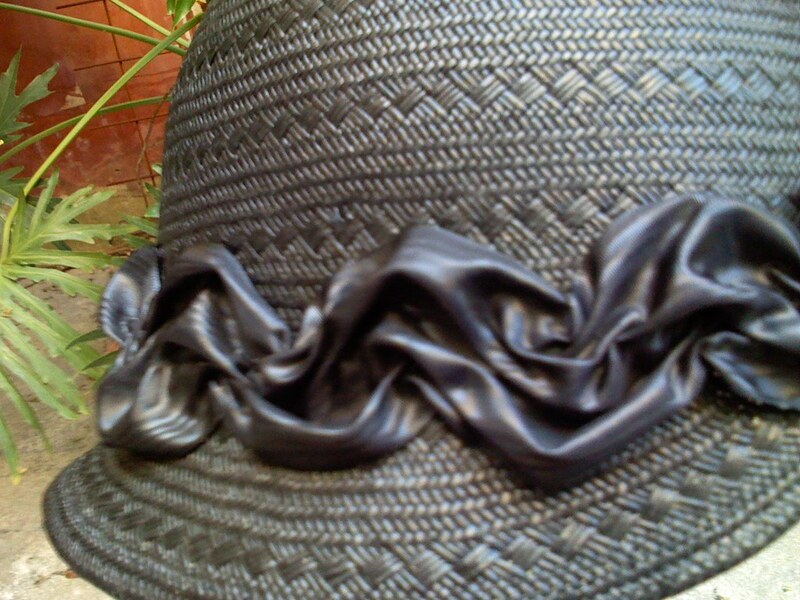 The first vintage ribbon that we were going to use, a wide waxed black ribbon turned out to be “burnt” and ripped very easily so it ended up in the bin. 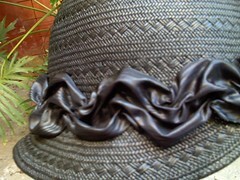 The second choice, this beautiful vintage moiré ribbon looks very beautiful on the hat. Nina thought of this classic ribbon trimming, where a running stitch following a zigzag pattern is made, and when the thread is pulled the ribbon gathers in a beautiful manner. She asked if I knew how to make it and I remembered seeing it in a book (probably more than one), so I just went ahead, and it was relatively easy. I marked the sections (corners of the triangles) with pins, and although I began by folding the ribbon and marking it with my nail, I ended up just doing it by eye using a long needle. Here is a picture from one of the books that show how to make this ribbon trimming (often referred to as purled ribbon or shell trimming). 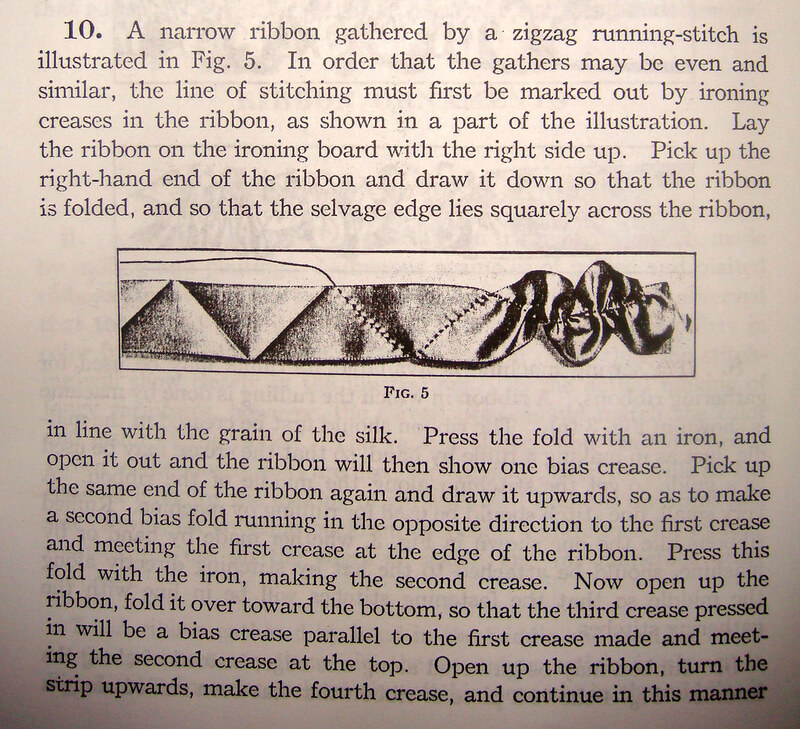 This is from a book called “Ribbon Trimmings A Course in Six Parts” by Woman’s Institute of Domestic Arts & Sciences Department of Millinery (Reprinted by Viv’s Ribbons & Laces, Sloan Publications ISBN 0-9631893-0-1). 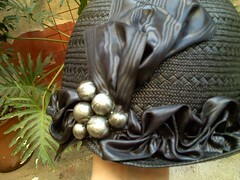 The beads are in fact plastic half spheres with two little holes to sew them on. They shine wonderfully. 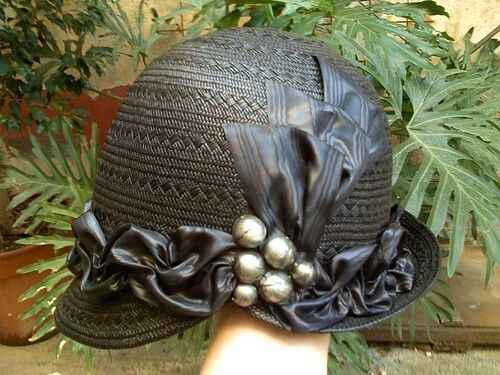 The three ribbon pieces that stick up have been carefully sewn in place for a natural look, and give the hat a nice sense of movement (we used up to the last centimeter available of the ribbon!). Finally, just say that the hat is unfinished, and will have a long black veil hanging from the right side, because it’s going to be a mourning hat on a theater play.